Since the dawn of time, people have been fascinated by gaming. An outrageous development of gaming is introduced in the current era. Not long ago people believed owning a laptop for gaming was a foolish endeavor but the trend is certainly gone now. Nowadays laptops are getting more powerful than ever. Laptops these days gives near-desktop experience with the advancement of comforting keyboards, adaptive display, portability and extreme performance. If you are searching for a powerful gaming laptop then you are at right place. Out of thousands of buying options picking up a reliable and best one is very challenging thus, we have narrowed down the list to pick the 5 best gaming laptops in Nepal. Let’s take a quick look at the list of 5 Best gaming laptops in Nepal under Rs. 2,00,000 as of 2018. MSI is always known to be the manufacturers of the classic yet extraordinary gaming machine. MSI GE62 Apache Pro is engineered with NVIDIA GeForce GTX at 1060 GPU for ultimate gaming experience. MSI GE62 Apache Pro is a VR ready machine that brings the next level of enthusiasm with breathtaking VR experience immersed meeting both Nvidia and VIVE. MSI GE62VR 7FR Apache Pro comes with an ultra-HD 4K LCD display providing extraordinary color and contrast, smooth motions and detailed animations. The Laptop has a metallic significant design embedded with the latest 7th GEN Intel i7 processor. MSI GE62 Apache Pro offers a dynamic temperature and performance balancing via turbo, sport, comfort or eco mode. The Authorised distributor of MSI product in Nepal is Ocean Computer Pvt. Ltd. MSI GE62VR 7FR Apache Pro is available at the price of Rs. 1,70,000 in Nepal. Aside from manufacturing excellent budget and productive laptops, Acer is expanding its line lineup towards gaming laptops. In the second half of 2017 Acer has introduced powerful gaming machines as Helios 300-series. Acer Predator Helios 300 G3-571-77QK is an actual predator with black matte black profiled finest metal casing, red highlighted chassis, lid and grille vent. The Acer Predator sports a full-HD wide IPS screen. The black and white backlighting chiclet keyboard sums up the premium look. The Acer Predator Helios 300 excels Nvidia GeForce GTX 1060 GPU coupled with 6GB of dedicated GDDR5 VRAM. The predator is embedded with the latest 7th GEN Intel Core i7 processor. Mercantile Office Systems is the authorized distributor of Acer in Nepal. Acer Predator Helios 300 G3-571-77QK is available at the price rate of Rs. 1,55,000. Asus ROG G752VM-series laptop represents the revolutionary design in Armor Titanium and Plasma Copper color scheme. The ROG G752VM series is very powerful enough to dominate gaming performance. The vibrant color around the “Republic of gamers” implied with a dramatic vent on the rear to give an icon platinum look. The laptop comes with a great interior beside an inspiring design. Asus ROG G752VM features a backlit anti-ghosting keyboard with 30-key rollover for definite direction and key control. The laptop is blessed with an unbeatable Intel® Skylake Core™ i7 processor coupled alongside NVIDIA® GeForce® GTX™ 1060 GPU with Pascal architecture on board. The laptop also features an immersive VR backed by GeForce® GTX™ 1060 GPU. Nagmani International claims to the authorized distributor of Asus in Nepal. Asus ROG G752VM-RB71 is available at the price rate of Rs. 1,99,990 in Nepal. Razer Blade is the first powerful and portable laptop introduced in gaming series. The iconic ultra-thin design makes the laptop very unique among others. The Razer Blade comes with a premium body and authentic blade skin design. The Laptop is powered by Intel® Core™ i7-7700HQ Processor with power performing NVIDIA® GeForce® GTX 1060 graphics. This insanely thin 14-inch laptop sports an ultra-HD 4K multitouch screen. The excellently engineered anti-ghosting razer chroma keyboard is available up-front. The Razer Blade features NextGEN VR performance backed by NVIDIA VRWorks™ technology for ultimate gaming experience. The Razer Blade Gaming Laptop is available at the price rate of Rs. 2,00,000 in Nepal. Dell started its evolution to the 15 7000-gaming laptop series from late 2015. Dell Inspiron 7567 is one of the best budget gaming laptop loved by many gaming enthusiasts. The Dell Inspiron 15 7000 Gaming (7567) is built with enough horsepower to back the graphics requirement. The 7000 series is available in 4 variants. Dell Inspiron 7567 sports all-metal premium body with slanted edges, vent on the back and crisscross design. The red backlighting keyboard is inset farther up in the deck. The laptop sports wisted Nematic (TN) panel instead of IPS on a (1920 X 1080) FHD screen. The laptop comes with a 7th Gen Intel® Core i7 processor embedded with NVIDIA GeForce GTX 1050ti 4GB dedicated graphics on board. Neoteric Nepal or Neostore is the authorized distributor of Dell products in Nepal. Dell Inspiron 7567 is available at the price rate of Rs. 1,29,990 in Nepal. 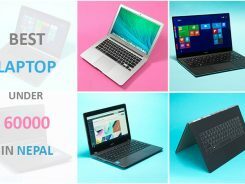 5 Best Gaming Laptops In Nepal with valid price rates. Note: Prices listed below may vary by a slight in some local shops and prices can be changed without notice. Stay with us for any changes regarding the prices of best gaming laptops in nepal.